To mark the end of Rip it Up, the National Museum’s exhibition of Scottish pop and rock we’ve compiled a pop quiz, giving you the chance to show off your vast knowledge of obscure and wonderful facts about Caledonia’s unique contribution to music. 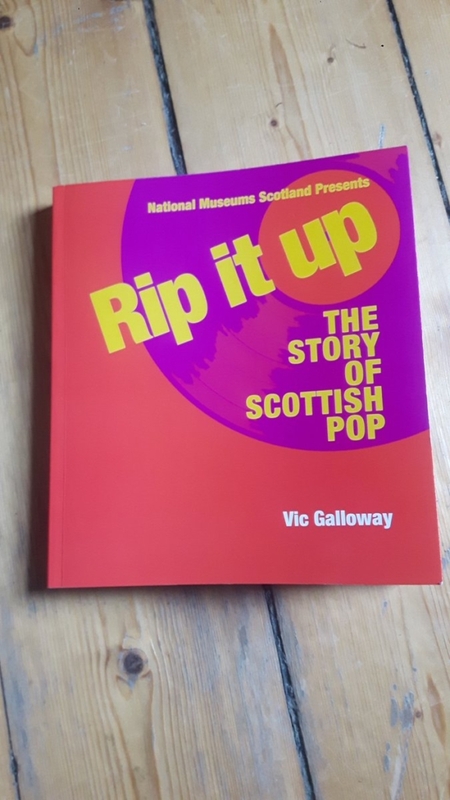 As prizes, we have 2 copies of Vic Galloway’s book of the same name, which explores our richly diverse musical culture from Lonnie Donegan to Young Fathers. To enter, email your answers to bellaletters@yahoo.co.uk by 8 p.m. on Thursday 29 November. Winners will be announced on Friday 30. Don’t shilly-shally! [you can play the Ultimate Scottish Playlist while you test yourself]. 1. Which Scottish label released the first Human League single? 2. The director of the 2015 movie Slow West was in which Fife band? 3. Who do Belle and Sebastian take their name from? 4. Where was Lulu born? 5. What was Annie Lennox’s group before Eurythmics? 6. Which singer earned his first live performance payment supporting an early incarnation of The Beatles at Alloa Town Hall in 1960? 7. Who is Dumfries native Alan Richard Wiles? 8. With which US film actress did the Bay City Rollers appear with singing Saturday Night on Irish TV? 9. Who was JAMC’s original drummer? 10. Which chart-topping band from Glasgow’s east end were originally known as the Gaylords? 11. Sheena Easton and Teenage Fanclub hail from which Lanarkshire town? 12. Which Two Ronnies regular was born in Dunfermline on September 27, 1947? 13. Silly Wizard wrote the theme tune for which popular TV sit com? 14. Name 2 hits by the Revillos/Rezillos. 15. Greenock’s John McGeoch played guitar for a succession of experimental bands in the late ‘70s and early ‘80s. Name three. 16. Where did The Incredible String Band get their name? 17. Where was Talking Heads’ David Byrne born? 18. Which Scottish city is name-checked in an Abba number one? 19. Which Scottish singer got his big break at a live Radio Clyde event in 2003? 20. What connects Orange Juice, Josef K and Aztec Camera? 21. Before the Rollers had a global hit with it in 1975, who performed the original version of Bye Bye Baby? 22. Which musician inspired the title track to John Martyn’s Solid Air album? 23. Which Tim Buckley song did This Mortal Coil make their own in 1984? 24. What connects Forfar, Kirriemuir and Fremantle in Western Australia? 25. Which Dundee duo won a record contract by covering David Bowie’s Boys Keep Swinging without copyright permission? 26. Which English chart toppers were managed by the Poets manager? 27. What Fife village do the Proclaimers come from? 28. In what year did Hue and Cry have a hit with Labour of Love? 29. Which synth-pop band found an international fanbase when they posted a song on New York’s Neon Gold Records in 2012? 30. Who was Franz Ferdinand? 24. AC/DC founder Bon Scott was born in Forfar and subsequently lived in the others. 30. Archduke Franz Ferdinand, heir to the Austro-Hungarian throne, was assassinated in 1914, triggering events that led to the outbreak of WW1. Will you be adding the answers here? Great, thanks. A couple of them were very difficult! Thanks for answers. You forgot about me being in JAMC. Didn’t realise Take The High Road was actually supposed to be funny.